A Soft Gentle Voice: Just. Trust. It is something she needs to lean into. Someone, really. Cast all her cares upon the One who gathers her tears and cups her life in the palm of His hand. We are called to a life of faith. But, she falters around in my her own strength, kicking and screaming at life's trials and stubbing her toe and falling down to the ground and then she wonders why she has no strength left. 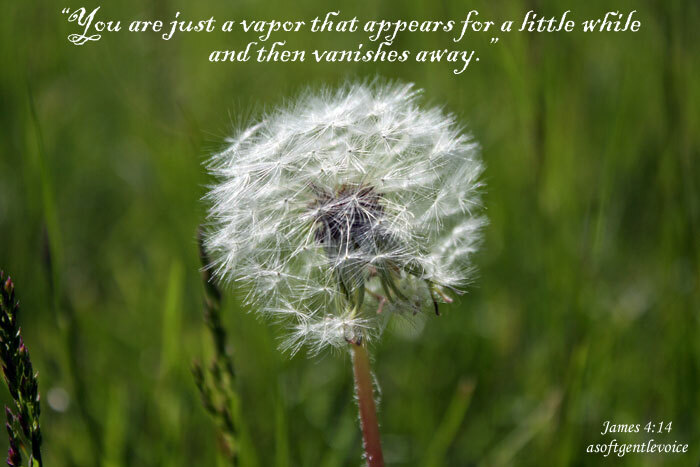 Life is a vapour. She doesn't have time to miss this. She was never meant to live it alone. He never intended for her to take charge of her own life; for her to take such control of her life that she really believed, for a time, that all was well. For when she looks up and around she sees how desperately she needs Him. Living in this anxiety, she quenches His Spirit. He wants her to let go. Cast it all on to His back and breathe. Surrender and seek Him. And trust. Ohh this is a hard one for me to learn. my darling tiny girl is in that phrase of nearly walking but not quite, and the bumped heads and the whimpering tears of frustration make me want to fix it all, all the time. what a thing to learn. Learning to fully trust is a life long journey. We are all a little farther along than we once were. Thankful to walk this journey with you! Wow, what a great picture to capture this verse! I have found that even this trust is a gift of love from our Lord as we learn through an intimate relationship that He is worthy to be trusted and He will never stab us in the back the way the world loves to do. Trust has never been something to me that I could just do. I had to walk with our Lord Jesus to learn how faithful He truly is. In other words He earned my trust. Letting go . . and that picture captures your words beautifully. Visiting from SDG. I know. Oh, I know. Just trust. The easiest thing and the hardest thing all at the same time. "Just trust." Oh this is one I'm working on. As I approach my husband heading off on his first deployment, trusting God is on my heart. Beautiful as always! Blessings. Very nice post. I just stumbled upon your weblog and wished to mention that I've truly enjoyed browsing your weblog posts. In any case I will be subscribing on your rss feed and I am hoping you write again very soon!